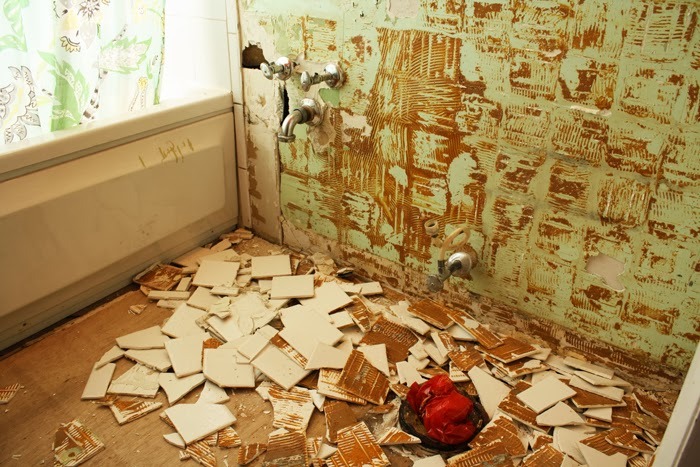 Tiles piling up on the floor, toilet in the living room...you know, typical Sunday-type stuff. 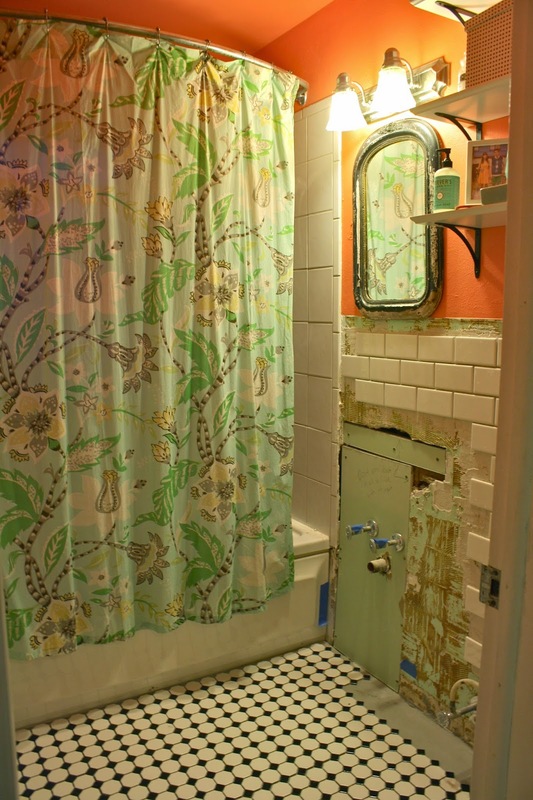 Six weeks ago we began the process of renovation our downstairs bathroom to make it fresh, fun and open. Six weeks ago, we thought we'd have a brand-new bathroom, all sparkling and beautiful. Six weeks ago, we thought we'd have that four weeks ago. But here we are, six weeks later with little to show for it. Things got halted by trips out of town, a death in the family and busy lives. I laid some subway tile on the walls, Eric patched up some holes near the sink plumbing and that's about as far as we got. With more busy-times ahead of us, we finally accepted the fact that maybe, possibly if we wanted this project completed by summer, we should call in a pro. You know we love doing projects on our own, but this time we had to weigh the pros and cons (which I shared in detail over on Make, Do and Mend), and in the end we called over our trust handyman Jamie (remember him? He did our first-floor renovation and his partner was also the man behind the "Dusty" Mr. Pancakes video...). Well, it's not so pretty yet... but you certainly get the idea. I lovelovelove the black and white, vintage-style tile. It already makes such a statement when catching a glimpse from the living room. I'm pretty wild about it. You can also catch a glimpse of the initial tile work I did weeks ago...pretty....impressive? Anyway, it'll look lovely once finished. We also scored a pretty incredible $25 sink from the Habitat for Humanity ReStore a couple of weeks ago. We wanted a wall-mount sink to open up more space in our tiny bathroom. And though it's not my beloved Brockway, it's definitely going to look beautiful in the space. We're aiming for a bit of a throwback look, and the sink will tie everything together. Speaking of the sink, I wanted to share the faucet we purchased to install with it. Now, at first I had my eye on this gorgeous faucet, again from Kohler. But....it would have set us back over $500. I tried to reason with Eric, saying how we saved so much on the sink, maybe we could splurge on the faucet a bit more, but we both agreed (or, should I say, he was very persuasive in talking me into agreeing) that $500 is just too much to spend on a faucet, especially when we've got two huge additions we're making to our home this summer. So anyway, I conceded and Eric managed to find a brushed brass faucet set for just $90. To have an entire bathroom sink and faucet set come in at around $115 is pretty remarkable, in my ever-humble opinion. Though I would have loved to share the step-by-step process of this entire project, including all the gaffs and swears that surely would have come with it if we would have done it ourselves, I know in the end we'll be happier with a more professional result. And trust me, with those aforementioned additions coming up? I'll have plenty more blunders to share in the future. Happy Monday, gang! I hope you had a fantastic weekend. My weekend, for the first time in weeks, was nearly wide open...and I loved it. Sometimes it's wonderful just waking up on Saturday and Sunday morning know you've got the whole day to do anything you'd like (or nothing at all). On Saturday, I had a bunch of errands I wanted to get done before Sunday rolled around, so I took off around town and knocked them out, one by one. I spent some time at Jo-Ann Fabric, stopped for my seemingly weekly trip to Home Depot, went to my favorite shop in Bay View, popped in the library to renew my library card and, of course, made the inevitable Target run. I thought it would take me half the day to do everything I needed to, but I ended up finishing up everything in just three hours! As with any time I run errands, it was hard for me not to make some impulse purchases along with the things that were actually on my list. You know I can't say no to pretty things, and on Saturday I gave in to a few lovelies that I just had to share with you all. It is almost without fail that every time I go to Home Depot, I come home with some kind of succulent plant. I just can't help it; they're so cute! This one is itty bitty, and it's sitting atop the vintage radio on a side table in our living room. This is the fourth succulent that's come home with me this month. I have a problem. I've had my eye on this Midwest necklace at my favorite local shop, Sparrow Collective, for ages. I love its simplicity and, of course, I love its sentiment. I may have had dreams of moving to the East Coast for years, but deep down I just love the Midwest. Represent. I am a notebook collector. I can't have enough notebooks in my life, and when I see one with a cool design, cute colors or fun phrase, I have to snap it right up. Right now, I've got five different notebooks sitting in my desk drawer, alone, each with only two or three pages of anything written on them. I saw this "Wish List" notepad, and I don't know if it was the adorable fonts or the faux-chalkboard background, but I just couldn't walk away. I still make more paper lists than lists on an iPhone app, so I know this little pad will get get use. Finally, the Mecca for all impulse buyers: Target. I think I can count on one hand the number of times I've walked out of Target with only the items I actually intended to buy (and often, I walk out with everything except the item I intended to buy). This trip was no different. Body wash? Check. Shampoo? Check. But...hey I should probably go check out the office supply aisle for...reasons... and.... oh my gosh Nate Berkus now has a line of office supplies and there are GOLDEN SCISSORS???? Golden scissors, you guys!!! I stood and marveled at the beautiful scissors, nay, shears, for what seemed like five minutes. I needed them. Everybody needs a pair of gilded shears. besides, it says right there on the package that they are "Superior Quality. "Gotta have quality scissors, folks. Into my basket they went. Beautiful. Nate Berkus, you are so special to me. Hey, give me credit. I also stood there, marveling at the golden Swingline stapler for five minutes. But my better judgement told me I really only need one gilded office supply. I put the stapler back (but have been thinking about it ever since). Sorry for the horrible photo. I was snapping quickly so as not to look like that freak taking photos of shiny objects in the middle of the store. After sticking the shears in my basket, I turned around and saw all the fun, new washi tapes behind me. Scotch makes washi tape now in a ton of really cute designs. I took a mental inventory of my washi tape collection at home and realized that it is woefully lacking in the color black. Could I let this injustice last any longer? Absolutely not. Two new necessary washi tape rolls came home with me that day. See? A much more complete collection. So those were my fun, impulse buys. Not too overboard, right? I mean, I could have given in and snatched up this little book I saw at Target, as well. But I didn't! See, I have willpower, people. I can walk away. But....I mean, come on. That's pretty hilarious. And also: kitten. How was your weekend? Are you an impulse buyer like me? I promise I bought some pretty productive, useful things, too. And I will share those with you in just a matter of time. Stay tuned!